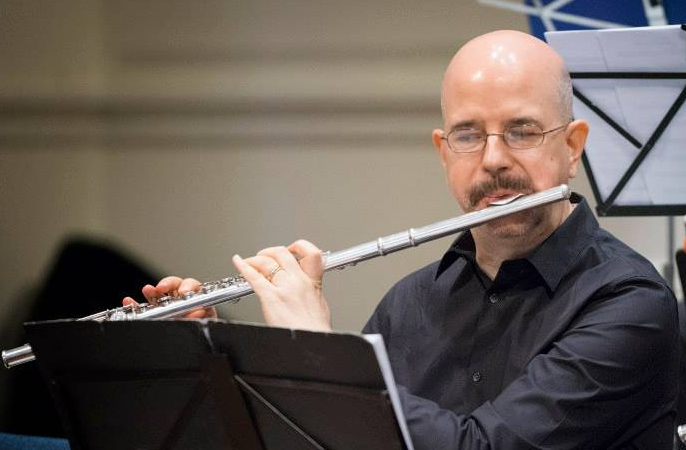 Scott plays flute and piccolo, serves on our board as treasurer, and is a founding member of QUO. I was invited by Jim Babcock to the founding meeting at Starbucks but unfortunately was out of town that week. But I was quite thrilled to be able to join at the first rehearsal. The first few times my friends and family came to visit, we would go to a show and some random midtown restaurant, which was always disappointing. When my father suggested we go to Olive Garden, as it was likely to be better than the places we’d been finding, I was chagrined to realize he was correct. Now I always make sure to take people to one of the excellent restaurants we’ve since discovered in the Village or Chelsea. The joke would be that it is a trill sign. I am forever being told that my trills are too loud (probably true); and that it isn’t about my trills (even though it most assuredly is). It’s funny because it’s true. I started playing flute in junior high school. Between a shouting maniac of a band director, and the usual high school environment for unpopular, shy, geeky students, I was quite glad to stop playing after I left high school. Eventually, I realized that I missed the actual music-making, and that adult groups weren’t likely to be unpleasant as school had been, so I picked my instrument up again in my mid-20s. Thirty years later, I’m still playing away. And I’m extremely happy and grateful to be here. Question from Andre: What do you do when you’re not rehearsing for QUO? music. I also play in The Lesbian & Gay Big Apple Corps, and I volunteer as much as possible to help both groups out. My husband and I love to travel whenever we can; I’d be happy to just play music, dine out, and travel.